The last few days have been extremely hot and although I am only 45 minutes away from the beach in Ventura, I may as well be in Palm Springs. To say it’s hot here today, would be an understatement and spending anytime outside in the garden isn’t possible, as it’s just to hot, but I wanted to continue with my comments about a few of the plants I have growing in my garden and with the exception of one dendromecon harfordii or Island Bush Poppy, most of the plants are from the chaparral community and thrive in the heat, although the Bush Poppy is doing fine & has managed to go through three summers so far without a problem. I can’t list every type of plant that is growing in my garden because there are so many different ones but another one of my favorites is Woolley Blue Curl or Trichostema lanatum that is supposedly difficult to grow but have done well in my garden in spite of the fact that I don’t have the ideal conditions for them to grow in. Three and a half years later, since I planted them they are still doing very well and each year put out a spectacular display of soft, velvety purple flowers on long stems. and are about 4′ tall and almost as wide. Hummingbirds love these plants as well as the Everetts Choice fuchsias and the Desert Lavender. The Desert Lavender, Hyptis emoryi is more native to the Mojave and Sonoran deserts but has thrived in my garden and on a day like today, that is in the 90’s they are probably smiling as I’m writing this inside on my computer because they love the heat. I have two lovely, tall plants against the house that are about 10 feet tall and generally covered in tiny, soft lavender colored flowers that draw the hummingbirds and butterflies to them all the time. They have graceful, narrow branches and lend a nice architectural appearance against the house and create a bit of shade next to my sitting area. Everyone of the plants that I chose for my garden, thrives in the heat prefers dry, rocky soil and in general, needs very little attention. 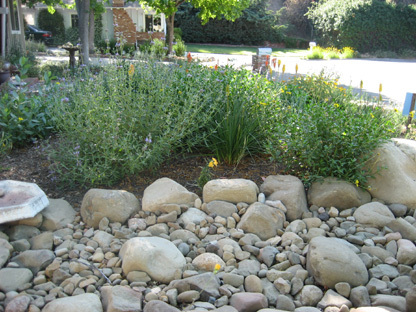 Ideally when you have a chaparral garden you have the best growing conditions, such as well draining soil but in most cases you probably won’t and need to make the best of it when you are initially putting in your plants. But the soil in my garden tends to be heavy however I am been fortunate in spite of issue and the majority of my plants have thrived and the mortality rate has been very, very low. I seldom water and all I do is any necessary trimming when it’s called for but other than that, I simply enjoy their fragrances, flowers, birds and butterflies and know that I have a tiny bit of that 7 million acres of chaparral in my front yard.